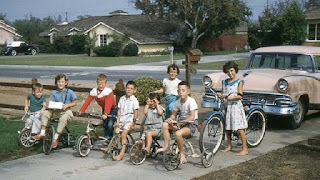 When I came across this photo it made me remember our Neighborhood Gang. If you were a kid in the late 60's, 70's and 80's you'd recognized this photo immediately, different aged kids, male and female just hanging out in the summer time. There were no computers, no video games, just endless sunshine, warmth and fun that lasted a little over two months before returning to school. Growing up in NM there were a lot of kids whose Dads were in the Military but also other professions, one Dad owned a Kinney's Shoes. Another was a Preacher, yet somehow all these kids from different walks of life got along and played together for hours at a time and had to be called in with veiled threats at nightfall by our parents. If our parents weren't so insistent we probably would have slept outside too, after Dinner of course. A typical Summer day in my NM neighborhood consisted of either a swimming lesson or a tennis lesson early in the morning. After that it was return home and then one by one, we would go to each others house and round up the Gang. One bicycle, then another and another and before you knew it, 10 bikes of all makes and models rolling down the street. Sometimes the girls didn't want to come out but we soon learned if we acted like we were having fun they would come out eventually, first watching then participating if a ball was thrown close to them. We played a lot of games, soccer, kickball, Frisbee, used the slip n slide and the water wiggle. Oh and laugh, laughter was non-stop. The time would fly by and before you knew it a Mom was calling. Lie a mother cat, each mom had a special call that only her kid could amazingly hear. One lady clapped, another whistled and another would bang a pot. One by one the Gang would disappear inside for lunch which by this time with the blistering NM sun we needed it. 45 minutes later we were back at it, chasing each other around the houses playing ball tag or freeze tag or finding a shady tree to kick back and let our meal digest. As we got older, the boys played more sports and the girls stayed inside but every now and then there was a rousing game of 'kick the can' even into our High School years. Amazingly, despite a few cuts and bruises, we made it through those Summers, with few regrets and a lot of fond memories. So here's to you, I hope you had a Neighborhood Gang to pal around with, and I hope I was able to stoke a few of those memories in your head, all these many years later.